Ancient coin talisman necklace. Sterling silver amulet pendant with a rare 2000 year old bronze coin from Celtic Gaul. Ancient coin talisman necklace. Sterling silver amulet pendant set with a rare bronze coin. This solid silver pendant features a genuine ancient bronze coin that was minted by the Carnutes tribe in Iron Age Gaul (now modern day France) around 2000 years ago! Although we will never know who’s hands the coin passed through, or what it was used to buy, it is still a tangible, physical link to those long-ago times when independent Gaul was ruled by the Celtic chieftains, warrior princesses and pagan druid priests made famous in the Asterix and Obelix stories. The coin has been set into a silver pendant, as if it were a precious gem. The mount itself was initially hand carved in wax before having a mould taken from it and being cast in solid silver. The design on the pendant was inspired by the pattern on an ancient shield that was recovered from the River Thames and is now housed in the British Museum. 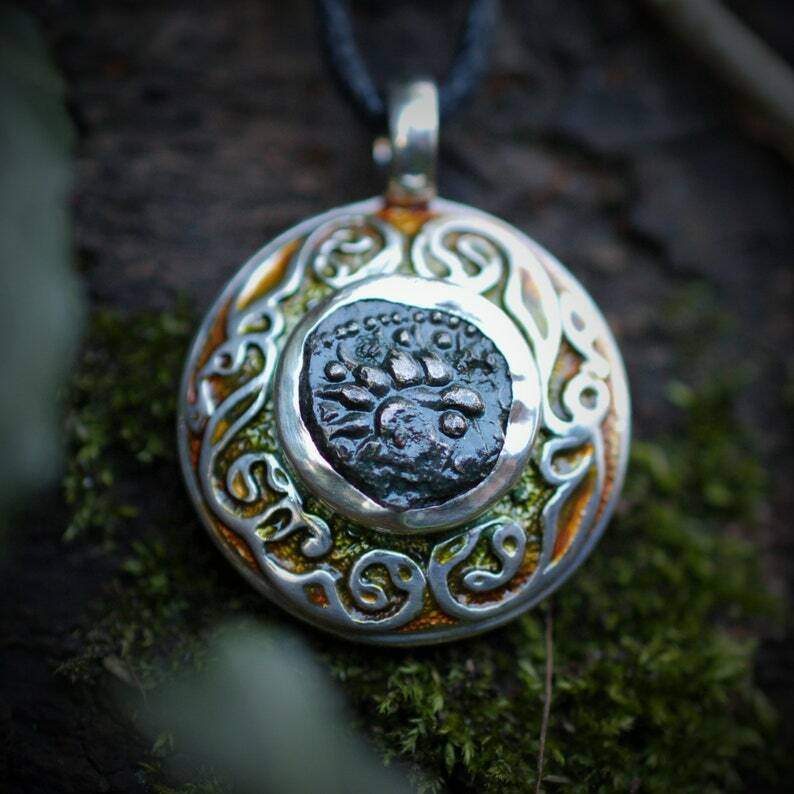 The finished talisman has been decorated with a green and gold patina, reminiscent of the French landscape, under which the coin had lain hidden for two millennia. It was finally given a Hallmark to prove it is solid sterling silver. The pendant weighs just under 17g, which is over half an ounce, and measures a little under 3cm, which is a bit over an inch in diameter. This pendant is supplied on a waxed cotton cord in its own gift box. If you would like me to supply a suitable sterling silver chain for this pendant, please contact me. Wearing a piece of Argent Aqua’s fine jewellery identifies you as someone who loves nature and the great outdoors. All of my silver jewellery is made from solid Sterling Silver (silver with a purity of at least 92.5%). It does not contain any nickel, lead or other harmful materials. All pieces are handmade in a small workshop in the English countryside and shipped to collectors across the world using insured & recorded post. Typical delivery time to the US or mainland Europe is between five and ten working days. Shipping usually takes longer around the holiday seasons. Anglo-Saxon coin talisman necklace. Sterling silver Norse design amulet pendant with a rare, bronze coin from the Saxon-Viking era. 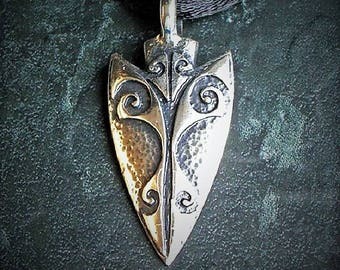 Kelpie necklace, silver and diamond chalk horse ancient hill carving pendant. Viking dogs necklace, sterling silver Norse talisman pendant with a Celtic zoomorphic design. Blue Tourmaline, raw Indicolite rare crystal necklace, sterling silver shield pendant, blue crystal talisman amulet, protective charm. Norse pendant, silver viking runes necklace, sterling silver traveller's talisman. Black Tourmaline, shield necklace, EMF shield, raw tourmaline crystal pendant and chain, crystal talisman amulet protective charm. Silver Spirit of the forest necklace with a dark, moss green coloured patina. Celtic, Art Nouveau stylised stag's head pendant. 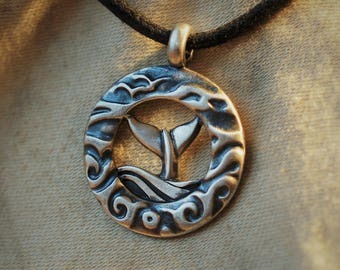 Freediver necklace, sterling silver freediving pendant, solid silver 3D apnea free diving charm. Barn Owl necklace , Sterling Silver and garnet barn owl pendant.